Our Lord Jesus Christ, the Savior of the world, was born of the Most Holy Virgin Mary in the city of Bethlehem during the reign of the emperor Augustus (Octavian) (Luke 2: 1-20). High in the skies is a star which sends down a single shaft towards the baby Jesus. This star is being followed by the Magi, the wise Persians from the East, who are bearing gifts to the Christ. On the right, the shepherds – people not regarded by anyone else – are the first to be given the Good News of Jesus’ birth. 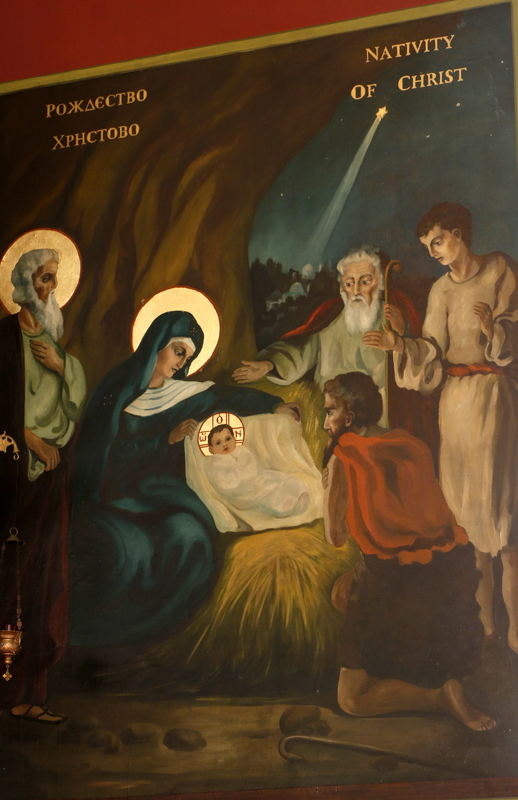 The shepherds are seen praising and offering veneration to the Christ-Child.